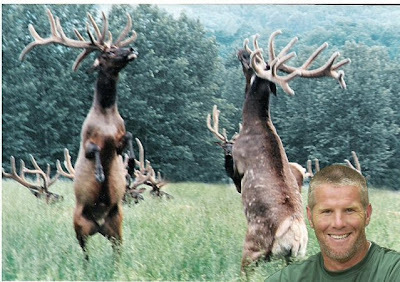 TTFTM News is reporting evidence of an evil "Elk Fighting Ring" has been discovered. TTFTM has it on good authority that famed quarterback Brett Farve is involved. Spokemen for the NAAGBP (National Association for Green Bay Packers) spokes man Mr. Black was quoted as saying, "Thousands of flys are killed each year, why isn't anyone reporting that?" This is sad. When you do stuff like this you know you have way too much money. Entertainment must reach a new plateau. I was at the Elk fights and I wasn't as impressed as the Fly fighting. And you thought man and insect were at war. No! The flies really go at it. Talk about Sh%$ slinging and name calling. And the devotion they have to the game. To be expecting while in combat. There have been so many maggot births during the fight (due to the sh%$ slinging), many pro-life and pro-choice marches have ensued. I think Kobe Bryant is behind this one, but police are still investgating. They have good reason because in recent years his game stunk. You silly, silly man. It's dolphins, not elk. Is Everyone a Crook Anymore?